Is Warrantless Tracking of Cell Tower Data Unconstitutional? Where do you come down on this ‘tracking’, who is doing it and what is it for? The police now seem to want to look into everybody’s bathroom, while people sit on the throne and talk on their cell-phone. Are the police allowed in their with you just because they want to overhear what you are saying? Tracking is one thing, but listening, do you see that for what it is? Spying on Americans? Or is it, just the world as it will be, until we get another Bush in the White House? Earlier this year, the Supreme Court ruled in a precedent-setting case that using a GPS tracking device on a vehicle without a warrant constituted a search and therefore violated the Fourth Amendment. 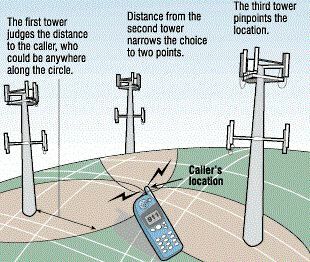 Now, the same defendant is seeking to have a similar precedent set for warrantless tracking of cellphone data based on cell tower location. Imagine you had poor cell service in your house, Dempsey said providing an example. You could essentially get a tower put in your house; almost every floor of office buildings have their own cell tower now for good service. Now you have a precise location of inside your home, Dempsey said, where you and anyone who visits you and uses their cellphone can be picked up as data by the cell company, which doesn’t require a warrant for information. But a separate appeals court ruled that a physical search of the cellphone — in this case to obtain phone numbers — was “so slight” of an invasion that it did not merit needing a warrant. While we’ll be watching court decisions on the constitutionality of cell tower data collection without a warrant, a separate story has emerged recently that local police departments are using this technique to obtain information — many in non-emergency situations. This practice was once thought reserved for federal agents. Check out the New York Times story for specific examples of local police departments using cellphone tracking technology here. This entry was posted on Monday, April 2nd, 2012 at 12:07 pm and is filed under News and politics. You can follow any responses to this entry through the RSS 2.0 feed. Both comments and pings are currently closed. 3 Responses to Is Warrantless Tracking of Cell Tower Data Unconstitutional?